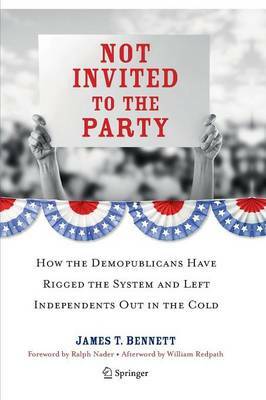 Not Invited to the Party demonstrates how the dominant political parties--the Democrats and Republicans--have co-opted the system to their advantage. James Bennett examines the history and array of laws, regulations, subsidies and programs that benefit the two major parties and discourage even the possibility of a serious challenge to the Democrat-Republican duopoly. The American Founders, as it has been generally forgotten, distrusted political parties. Nowhere in the U.S. Constitution are parties mentioned, much less given legal protection or privilege. This provocative book traces how by the end of the Civil War the Republicans and Democrats had guaranteed their dominance and subsequently influenced a range of policies developed to protect the duopoly. For example, Bennett examines how the Federal Election Campaign Act of 1971 (as amended in 1974 and 1976), which was sold to the public as a nonpartisan act of good government reformism actually reinforced the dominance of the two parties. While focused primarily on the American experience, the book also considers the prevalence of two-party systems around the world (especially in emerging democracies) and the widespread contempt with which they are often viewed. Featuring incisive commentary on the 2008 election, and a foreword by third-party iconoclast, Ralph Nader, the book considers the potential of truly radical reform toward opening the field to vigorous, lively, contentious independent candidacies that might finally offer alienated voters a choice, not an echo.